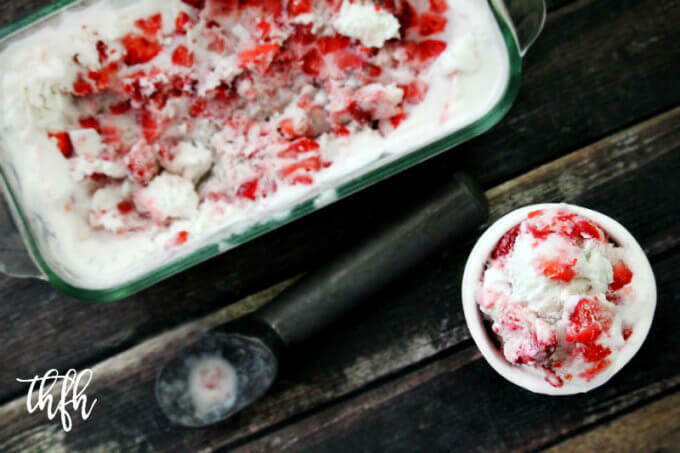 It can’t get any easier than this simple Vegan Strawberry Ice Cream recipe that needs only 4 healthy ingredients to make and no stove top cooking needed. 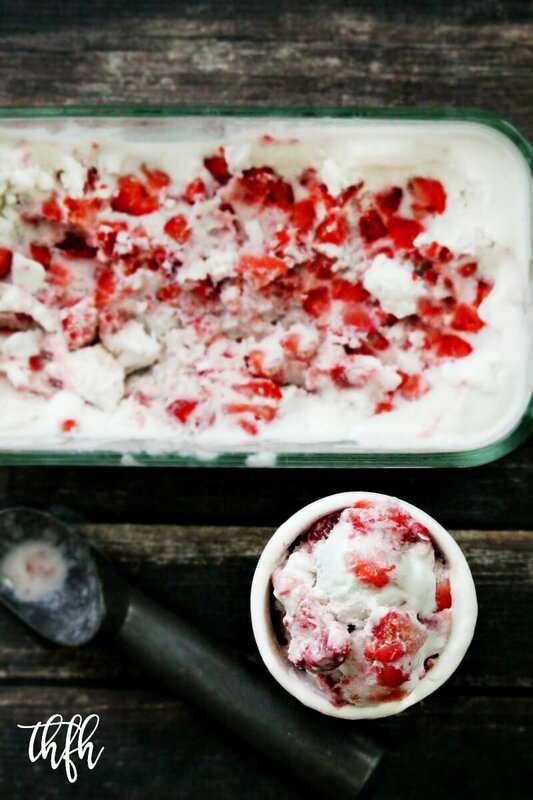 Whole Foods had their organic strawberries on sale last week so I made a batch of one of our favorite ice cream flavors in our house – strawberry! Instead of the typical solid pink ice cream that blends the strawberries into the ice cream base, I like to make a vanilla base ice cream and add lots and lots of chopped strawberries to make sure there’s some in every bite! It takes less than 5 minutes to make with a Vitamix and you can make this with or without an ice cream maker (no-churn method). I actually prefer the ice cream machine method for this ice cream because it has a soft-serve texture and you just add the strawberries in right at the end, so they’re not frozen. This typical ingredient list contains GMO ingredients (corn syrup), dairy and (2) food colorings. Homemade versions a a little better, but still contain dairy ingredients like these: whole milk, heavy cream, heavy whipping cream, half and half, refined white sugar, eggs and some even require you to cook the mixture on the stove top. This healthier version only needs 4 clean, real food ingredients and it’s vegan, gluten-free, dairy-free, egg-free, paleo-friendly and contains no refined sugar. Want more healthy dessert recipes? Check out Gluten-Free Vegan Vanilla Bean Ice Cream, Vegan Pecan Praline Ice Cream, Vegan Chocolate Peanut Butter Swirl Ice Cream or my Clean Eating Cookbook with 3 entire chapters of healthy, clean eating dessert recipes just like this one that you will love! Add all the ingredients for the ice cream to a Vitamix and blend until creamy and smooth. Adjust the sweetener to your preference. Transfer the mixture to an ice cream maker and make the ice cream according to your machines directions. Option 1: If you will enjoy right away as a soft-serve ice cream, add the chopped strawberries at the end of the ice cream cycle or when directed by your machines instructions. Serve. Option 2: If you prefer a harder ice cream texture, pour the ice cream mixture into an air tight BPA-free freezer safe container. Add the diced strawberries and gently stir them in to make sure they are evenly distributed. Cover tightly and place the container in the freezer for 1-2 hours, or until it gets to the consistency of your preference. The recipe and photographs for "Vegan Strawberry Ice Cream" by Karielyn Tillman of The Healthy Family and Home website are licensed under a Creative Commons Attribution Non-Commercial No Derivatives 4.0 International License and cannot be used without my written permission. Hi there Enda! Normally when I make this recipe, I use fresh strawberries, but I’ve also made it with frozen organic strawberries too. I let them thaw slightly (not all the way), but just so they’re soft enough to dice them. This strawberry is cream looks delicious. What kind of ice cream machine do you have? Hi there Kenda! I use a Cuisinart ice cream maker and have had it for many years now…it’s held up well as much as I use it lol!